The golden era of Indian comics, dominated by Amar Chitra Katha, offers a nostalgic high. After cooling off from that peak, the enterprise is again gaining superpowers, not unlike some of its characters. With conventions like Comic Con drawing thousands of visitors in Indian cities and publishers turning to new themes, bolder colors, and glossier pages in the quest for wider audiences, the industry is on an uptick. 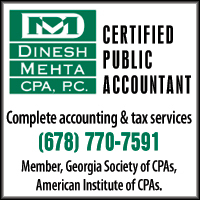 Atlanta-based Vamsi Duvvuri teases meaning out of numbers in his job. That entails wading through fine-grained data sets, burrowing into figures, and ferreting out patterns in them. As a datascientist, Duvvuri dreams numbers. And yet, crunching data all day long is a job not without stress. His antidote? Comics! Indeed, it is Duvvuri’s favorite way to unwind. In a flash, he can leave behind the cold, hard, objective world of mindboggling data and zoom right into the illustrated world of cool characters and piquing plots. “I enjoy reading about superheroes. 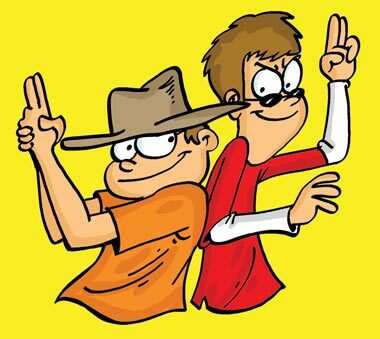 I used to enjoy Super Commando Dhruv and Naagraj.” Now a fan of Dilbert, and Calvin and Hobbes as well, he grew up in Hyderabad reading Amar Chitra Katha (ACK), Diamond Comics, Raj Comics and Chandamama. Champak, Suman Saurabh, Misha, Tintin, Suppandi (“lovably stupid”), and Chacha Chaudhary (with Rocket, the dog, and Sabu, the giant) filled his imagination. “My brother and I won a local library competition one summer where we read 1005 comics in 50 days. We used to subscribe to Champak, and also buy a lot of Diamond and Raj Comics. We also ran small comics libraries during our summer vacations,” says the father of a newborn baby daughter. Even today, Indian comics are a shopping staple during holidays in India and Indian-American children here often receive comic books as gifts from family and relatives. Away from home, far removed from merrygo- rounds with home-grown characters, maneuvering bits and bytes, people like Duvvuri are immigrants also to the fantasy land of comics. And they retain a special place in their heart for Indian comics, their first love. “I learned a lot about Hindu mythology through comics,” Duvvuri remembers. Generations of Indians got their emotional sustenance from Indian mythology, an inexhaustible source of stories of valor and cowardice, integrity and moral turpitude, magnanimity and greed, and all the values permeating the continuum of life. Legions of those who grew up in urban India in the late seventies and eighties will tell you unabashedly that if they know anything about mythological and historical Indian characters of India, it is thanks in a huge part to the formidable Amar Chitra Katha collections. From Krishna and Sudama to King Ashoka and Rani Lakshmibai, from Meerabai and Sant Tukaram to Subhas Chandra Bose and Gandhi, and even relatively obscure or regional characters like Ghatotkacha or the Gujarati lovebirds, Jesal-Toral, the ACK was a veritable treasure chest of richly illustrated, captivating stories of characters across India’s vast timeline and expanse. “Mr. 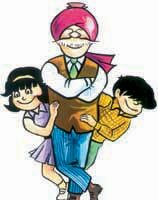 Anant Pai, the founder of Amar Chitra Katha, had conducted a study in schools where he found children retained information better when they were taught through the medium of comics. Even now, the ACK biographies are in demand in educational institutions. As for mythology and folktales, many Indians can trace their first mythological story back to an Amar Chitra Katha comic and they remain as relevant today. Small wonder, because mythology is perfect for comics, containing the elements of storytelling and fantasy that make for great art and writing,” says Rajani Thindiath, Editor, Tinkle. Along with ACK, Raj Comics and Indrajal Comics were perennial favorites with most readers growing up in the 1970s, ‘80s, and ‘90s. 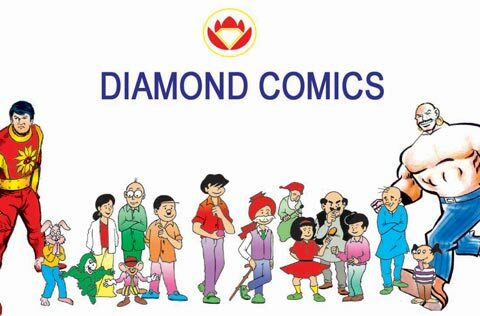 Diamond Comics, too, continues to regale audiences with everyday characters like Chacha Chaudhary and the kids Pinki and Billoo. 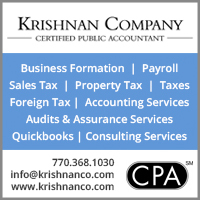 It publishes in English, Hindi, and all the regional languages of India. Growing up, the image of Lord Hanuman lifting the mountain, or the Bhagavad Gita’s divine form of Krishna, or the bhakti-inspiring stories of India’s saints and sages, Birbal’s subtle wit in coaxing some sense into his master, Emperor Akbar, the heroic tales of Shivaji, Bhagat Singh and Chandrashekhar Azad, the riveting stories from the Panchatantra and the Jataka Tales—all of these left an indelible impressions on our psyche. A full-blown Avatar-like atmosphere inhabited by these immortal characters exists in our heads. “The only superheroes that have seen pan–Indian appeal are our gods from mythology. They are all fantastically etched characters brought out through complex plot lines. Each story is allegorical to the human condition and yet explores its scope beyond it. At the root, each story may be about good vs. evil but a lot of them also explore various philosophical theories in a form that is easy to ingest. They have come to define the people we are,” Thindiath says. The collective unconscious is a storehouse of powerful images, a space filled with universal archetypes. What comics do is re-jig these memory- sets, invoke, and inspire these images to life. In Indian comics, heroes operate on a completely vaster plane, whereas in Western stories, they mostly operate on the physical plane. “At the root of it, it is about fantasy. We fantasize about extraordinary strength and abilities, and it’s a great way to rise above what we are, to aspire to be more. Whether it is our deities or Western superheroes, it is about humanity rising above what it is. “At the root of it, it is about fantasy. We fantasize about extraordinary strength and abilities, and it’s a great way to rise above what we are, to aspire to be more. Whether it is our deities or Western superheroes, it is about humanity rising above what it is, and that is an aspiration that will remain,” observes Thindiath. Mythology is essential. Children crave stories, and everyone looks for glory. Myth satisfies both. Since America doesn’t have mythology, it created superheroes, soldiers in full-body armor and with weapons, raining hell on villains. Of course, Greek and Nordic mythology find a place in Western comics. It’s not an exaggeration to say that comics contributed to what it means to be Indian, amidst the flux and malleability of identity. It’s also no overstatement to say that the comics fostered the spirit of national integration. Some publishers, like Diamond Comics, have also tried to spread awareness about social issues such as hygiene and the importance of voting. 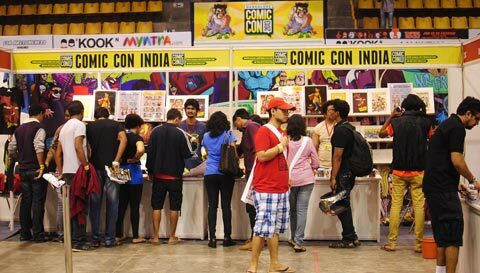 With conventions like Comic Con drawing thousands of visitors in Indian cities and publishers turning to darker themes in the quest for wider audiences, the Indian comic book industry is at the threshold of a big boom. Of course, changing times have brought a growing fascination with cartoons. In recent years, children have been spending more time watching cartoon films than reading books. They’re plugged into futuristic and scientific storylines, rather than just into mythological. To compete with this phenomenon, publishers have taken to making their books more visually appealing, with brighter colors, and glossy paper. “Comics are cooler than ever before, and being geeky is mainstream. Comics are influencing pop culture like never before. We are getting people who are not regular with reading comics following up on their favorite characters via films, animated series, and games. It’s taking these characters and story lines to different places, and it’s damned exciting,” says Jatin Varma, founder of Twenty Onwards Media, an alternative media house with interests ranging from publishing to films to live events. 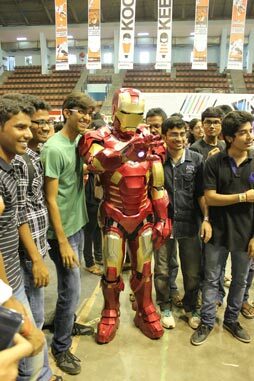 His company organizes India’s Comic Con. There’s a new kind of readership for comics in India which wasn’t there in prior generations. In older days the prime market used to be the urban middle- class kids, a group with limited buying power. Comics were considered too amateurish for the college crowd. That’s no longer the case. Recent Comic Con gatherings have been full of yuppies and college kids, with a lot more money in their pockets than their parents used to have. There are also people in their thirties and forties, on a nostalgia trip, buying up merchandise and vintage comics and memorabilia. It’s probably this market that is driving up the boom. 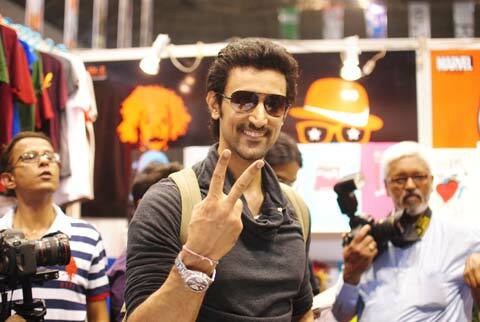 As his experience with Comic Con shows, Varma feels “reading and collecting comics is not something for the few. It’s something that is now considered mainstream. Being a dedicated fan of a particular character or franchise (for example, Star Wars) is not something trivial. It’s something that the individual celebrates.” And this sense of identification with a character or a franchise is helping the comics industry, with the college-going and early-twenties readership taking to comics in a big way. The past two decades have seen an expansion in the genres and formats of Indian comics, with publishers bringing in noticeable transformations and moving beyond “simple retellings of folktales and mythological stories to more nuanced storylines with plenty of layers and twists,” Thindiath points out. “Our books reach beyond urban centers,” he continues. “It’s about expanding your market, reaching out to interior areas.” Publishing in local language has helped Diamond Comics increase its reach. In addition, “[Diamond] comics are fun-oriented through and through. They are positive stories, family stories. Parents like to buy them for their kids. Foreign comics have blood and [gore]. As to distribution, they don’t have network. They are sold in metros and cities, but a bigger India is out there. The foreign comics don’t reach them. And their price is very high. In our comics, for a hundred rupees, you get 300 pages of stories, art, and color,” Rai adds. Newer companies like Graphic India, Mantra Ray Comics, and Level 10 Entertainment Pvt Ltd are trying out new story lines and platforms. Although the Indian comics industry is not as big as that in the West, interest in comics and graphic novels is on the rise in India. Techsavvy start-ups are experimenting on and exploring new storylines, like dark themes. Old publishers are pushing themselves into the internet and the world of apps, and getting into YouTube, VODs, feature films, animation, and 3-D films. 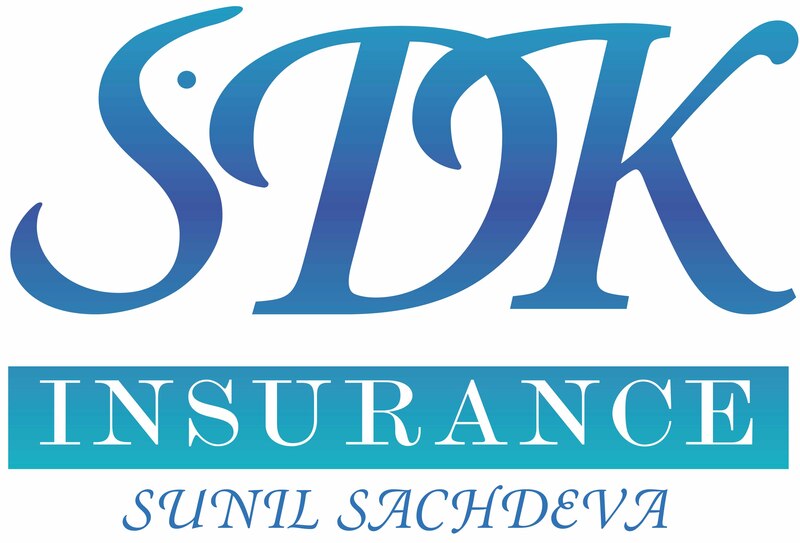 Their main breakthroughs in terms of sales and reach have come from publishing in the regional languages. 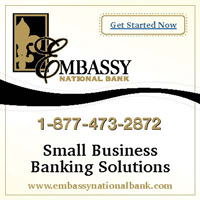 E-commerce has made it convenient to reach out to more people. Social media facilitates better communication between the creator and the user. Digital versions of books are being picked up, even if only in small numbers. However, the downside for the Indian comics industry has always been a flawed distribution network. Also, Indian comics have not received much support from the film and television industry. 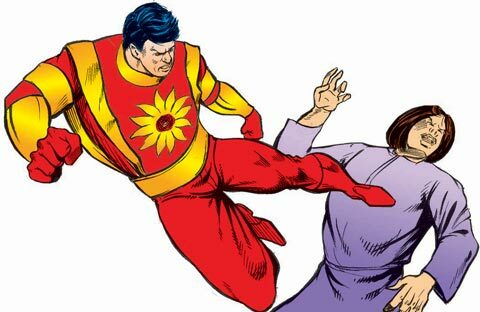 Unlike in the West, where comics have been made into hugely successful films and franchises, very few comic book stories have been adapted for film or television in India. An exception, perhaps, is the series Chacha Chaudhary, featuring Raghubir Yadav. With new technologies evolving in printing, animation, and digitizing, everyone agrees this is an exciting time to be doing comics. “In the long run both readers and content creators have to think beyond just the books. We need to tap animation, gaming, merchandise, films, and television,” Varma remarks. G.B.S.N.P. Varma is a freelance journalist based in Andhra Pradesh. His work has been featured in The Hindu, The Caravan, Hans India, Fountain Ink, and Avantika. The setting: Bombay, India, post-World War II. A narrow-gauge slow train transports European soldiers from the dockyards to the Victoria Terminus rail station in the city. Local ragamuffins are known to run routinely alongside the train hoping to grab at the largesse of the soldiers, who are known to drop chocolates and money or other goodies sometimes. One fine day a soldier hurls out something that looks like a magazine. The usual scrimmage follows as the robust gang of kids fights to lay a claim on it. Before long the “magazine” is claimed by a dozen different kids, each holding a page or a few of them. Little Abid Surti, all of six or seven years old, gets one solo page. When he goes home and checks it out, he is fascinated by the images of a cuddly mouse. Turns out he is holding a page of a Mickey Mouse comic book. It seems something clicks within young Surti who feels, quite naturally, that he can draw characters like this mouse. Without losing any time, he is at it…and a cartoonist is born! It is thanks to that one page, tracing back to a foreign solder, that “I am now also a cartoonist,” narrates the National Award-winning author, playwright, journalist, screenwriter, environmentalist, and the creator of Bahadur, Inspector Azad, Dhabbuji, and other favorite Indian cartoon characters. This fascinating narration by Surti is captured on celluloid in a documentary film called Chitrakatha: Indian Comics Beyond Balloons and Panels, made by Alok Sharma. Still a work in progress, it is a first-of-its-kind documentary on the evolution of comics in India. “Comics have been my first love since I can remember,” says Sharma. He traveled all over the country, put in years of research, talked to the unsung heroes of comics, wrote the script, directed, and produced the film. Sharma had a humble beginning as a political cartoonist at the age of 16. He began his career with Gotham Comics (later Virgin Comics). After that, he worked with radio stations like Radio City and Radio One. He was later associated with the TV wing of the Walt Disney Co., India. He explored animation with Big Animation and worked on their acclaimed title Little Krishna before he went independent. According to Sharma’s research, 1960-70s can be called the formative years of Indian comics, when Indrajal Comics was formed and later Amar Chitra Katha began its operation. The ’70s saw the massive success of these two publications inspiring several others. This was also the decade that spawned the advent of several humor-based comic magazines like Deewana, Lotpot, and Madhu Muskaan. 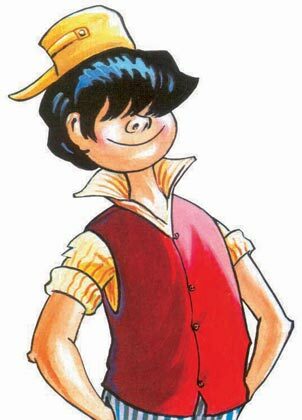 The ’80s were the golden age of Indian comics. India had as many as 60 publishers publishing in this arena (most of them were based in North India) and 90 percent of the content was homegrown. Comics were a rage till the early ’90s, after which they took a bit of a nosedive. Fresh content includes Rajesh Devaraj’s delightful Sudershan (Chimpanzee) that takes us back to the world of the black-and-white stunt cinema of the 1950s, with its talking animal stars, and Sumit Kumar’s semi-autobiographical and hilarious Itch You Can’t Scratch, which explores the life and times of an average urban youngster.